There is something intensely primordial about Semih Kaplanoğlu's Turkish drama, Bal (Honey), the third in the director's "Yusuf Trilogy," following Yumurta (Egg), and Sut (Milk). Each film has followed the events in the life of a man named Yusuf, once as a man in his middle years (Yumurta), once as a recent college graduate (Sut), and in his most recent incarnation in Bal, a young boy just starting school. By telling Yusuf's story in reverse, Kaplanoğlu aims to deconstruct the character, to peel back the layers to the core of who he is. The director has remained mum on if the character of Yusuf is even meant to be the same person in each film, preferring instead for Yusuf to be a more universal and open character through which the audience is allowed to live. In Bal, Yusuf is only a child just starting school who is having to deal with an embarrassing stutter. Each day the students are asked to read aloud in class, their success rewarded with a small red badge of honor. Yusuf greatly covets one of these visual symbols of achievement, but his nervous stutter is holding him back, causing laughter and derision amongst his classmates. However, when he is at home with his father, his stutter goes away, and he finds himself able to read everything from his calendar to the Qu'ran with ease. In fact, everything seems better with his father. Yusuf and his father share a very close bond, often traveling into the forests together to tend to the family beehives. In Yusuf's world, the forests are mystical places, filled with magic and infinite possibilities, lending the film an ancient sort of wisdom that seems to permeate every frame. 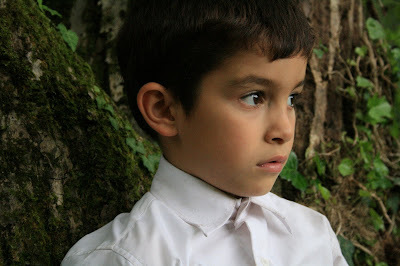 When he and his father are in the forest together, everything is perfect. But that idyllic spirituality is endangered when the bees suddenly stop producing honey and disappear altogether, threatening his family's livelihood. So Yusuf's father sets out into the mountains alone in search of the bees and their life-giving honey, while Yusuf remains behind to struggle with the every day challenges of childhood. But as the days go by and his father has not returned, Yusuf begins to sense that his life is about to change, and he makes a decision that could change the course of his life forever. There is something both hauntingly primeval and laboriously academic about the film that is at once compelling and frustrating. Kaplanoğlu once worked as a film critic, and it becomes obvious in his often pedantic attention to detail. It's all so precise and well planned that it's almost too planned out, an over-thought piece of intellectualism that is often too stuck in its own mind. But when Yusuf and his father are in the forest something else emerges - an evocative and lyrical journey into the unknown that becomes something of a spiritual experience. Kaplanoğlu skillfully pares down Yusuf's journey into the essence of the human soul, and it's nearly impossible not to be touched by the hushed and reverent connections to the natural world. It makes for a fascinating mix of the studious and the artful, a strange amalgam of left and right brained filmmaking. Kaplanoğlu may overthink his analytical machinations, but he companies it with such primal wonder that it attains something much greater. If it could get out of its head, Bal would be a truly great film. Instead there is a seed of an idea planted deep within its mysterious forests, waiting for the patient and the brave to come and find it. 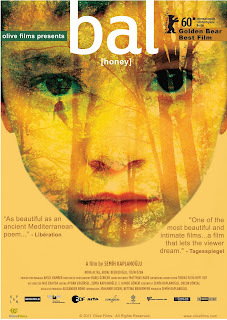 BAL (HONEY) | Directed by Semih Kaplanoğlu | Stars Bora Altas, Erdal Besikçioglu, Tülin Özen | Not rated | In Turkish w/English subtitles | Opens Friday, March 25, in New York. I comprehend the mild disclaimer you offer here, but appreciate the generally excellent review. I have hopes to see this later tonight at the Village East Cinemas.